Wait a minute… I was just grilling brats for Labor Day! I blinked and the holiday season is almost upon us – time to start planning those wonderful family feasts. 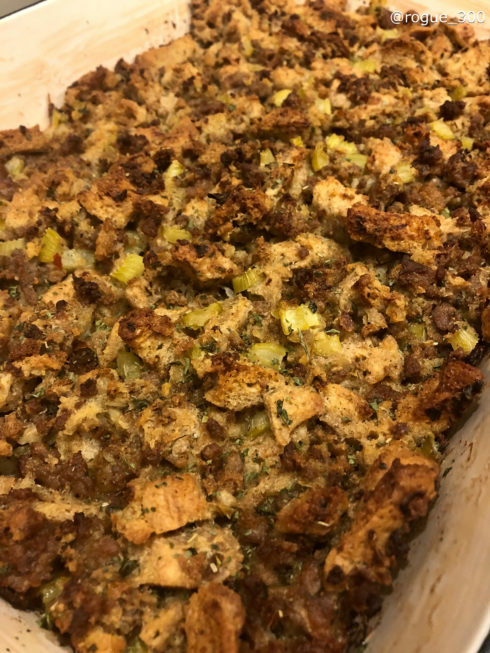 Give this superb sausage stuffing a try for your next holiday. You can make it the day of, weeks (or months) in advance, and freeze it; or assemble it 1 or 2 days ahead, store it covered in the refrigerator, and then bake it. Preheat over to 350 degrees and grease a 9″ x 13″ casserole dish with butter. Place the bread cubes in a large mixing bowl. In a large saute pan, melt the butter. Add the onions and celery. Cook over medium heat, stirring occasionally, or about 8 minutes, or until the vegetables are soft. Add the garlic and cook an additional 1 or 2 minutes. Add the vegetable mixture to the bread cubes, being careful to scrape out all the vegetables. Without washing it, add the sausage to the same pan, breaking it up as it cooks. Cook for 8 to 10 minutes, or until browned and cooked through. Add the sausage and fat in the pan to the bread cubes bowl. Add the chicken broth, egg, rosemary, sage, parsley, salt, and pepper to the bread cubes. Mix until the bread is soft and moistened. Transfer the mixture to the casserole dish and bake for 65 to 75 minutes, uncovered, until golden brown and crisp on top. After baking and allowing to cool, this dish can be frozen, tightly covered for up to 3 months. To reheat, defrost in the refrigerator for 24 hours, then reheat it, covered with foil, in a 325 degree oven until hot.